Brian, with Rien, founded Equus Industries Ltd in 1982. He originally trained as a Chemical Engineer and joined W.Graham Hithchins Ltd. He resigned after eighteen years, and was joined by Rien, who had been Hitchins’ chemist, established the factory at Riverlands in Blenheim and embarked on establishing a new brand in the market, including a completely new career as the salesperson, covering a territory that extended from Auckland to Invercargill. There are legendary stories of those early days, as the Company strove to make its mark on the waterproofing industry in New Zealand, and also through associates in Australia and Singapore. The hours were long but the Company grew and enduring friendships made with applicators and clients. For a completely untrained salesman it was a steep but rewarding learning curve. Inevitably, firstly with agents in the main centres, and then with dedicated sales staff working from regional offices, Brian was “rusticated’ to a purely management role. But the missionary zeal is still there and the fire is easily lit still. As a result of his interest and experience in the waterproofing industry, Brian is a member of a number of professional bodies, including SCANZ, ASTM, NACE, IChemE and particularly the Waterproof Membrane Association, of which he is Vice-Chairman and Technical Advisor. In spite of the all-consuming passion of Equus, Brian does have other interests. He learnt to fly when 50 and ended up as Treasurer of the Marlborough Aero Club for many years. 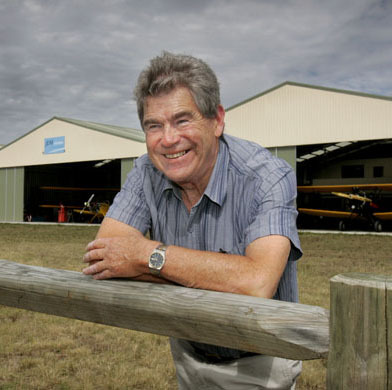 For the last 12 years he has chaired the New Zealand Aviation Museum Trust which operates the now world-renowned Omaka Aviation Centre and is also heavily involved in running the biennial Classic Fighters Airshow, as well as working on the build of a couple of vintage aircraft projects. There is still also some time for drinking red wine, trivia quizzes and dilatory classical piano!